In such cases, the question that revolves around everybody’s minds is what is swine flu and how exactly is it caused? Swine flu in Delhi – What is it and how is it caused? “Swine flu is a viral respiratory infection in humans caused by H1N1 virus which is occasionally transmitted from pigs who act as a reservoir for this virus to humans like farmers and veterinarians who may have close contact with these animals. The infection is then transmitted from person to person through droplet infection,” says Dr. Mayank Uppal, Internal Medicine Consultant at Sitaram Bhartia Hospital in Delhi. 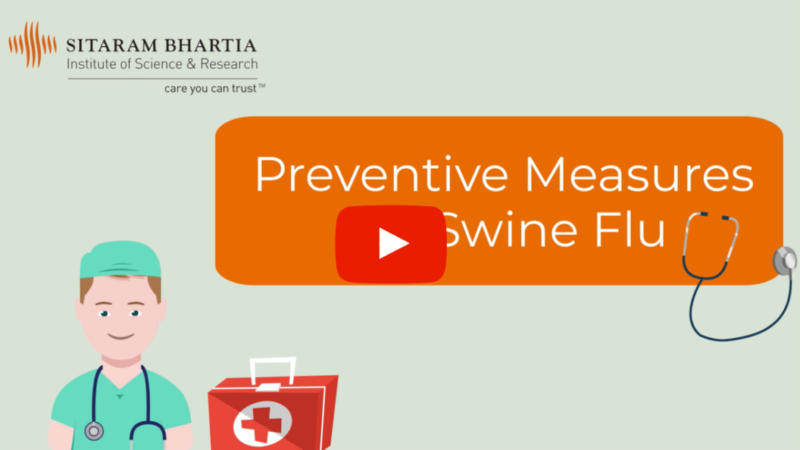 Swine flu causes – How can we identify swine flu? But how does the virus enter our bodies? “The H1N1 virus can enter our body quite easily when we inhale the contaminated droplets from an infected person when they sneeze or cough. The virus can also be transferred to us through an exposed surface via our eyes, nose or mouth. That’s why swine flu is considered to be a highly contagious disease,” explains Dr. Mayank. Symptoms of swine flu are similar to those of common influenza. “Swine flu symptoms usually develop within 1 to 3 days of the virus entering the body. But it must be noted that not everybody who has been exposed to the virus experiences the above symptoms. At times they may not present with any known flu symptoms at all,” says Dr. Mayank. “Generally we carry a physical examination for the people who present with common flu symptoms. But a rapid influenza diagnostic test (throat swab) is conducted to detect the H1N1 influenza virus,” says Dr. Mayank who comes across many patients with swine flu-like symptoms especially during the peak winters in Delhi. What is the proper course of Swine flu treatment? In the absence of any chronic health condition, most people affected by swine flu are prescribed medications to relieve the symptoms. Apart from medication, people can follow some simple steps at home to accelerate the process of recovery from the illness. Rest as much as possible. Sleep more to allow your immunity system to fight the infection. Increase your fluid intake by drinking more water and juices to prevent dehydration. Take paracetamol when you have high fever or body aches. This blog post is written with editorial inputs by Dr Mayank Uppal. The doctor has over 7 years of experience and is known for his patient and reassuring nature.